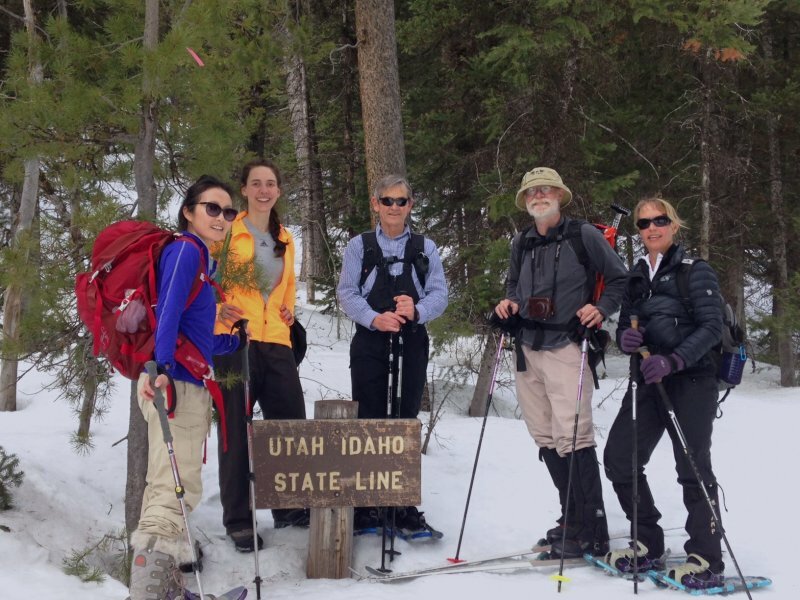 Seven Cache Hikers joined this final event of the winter season. 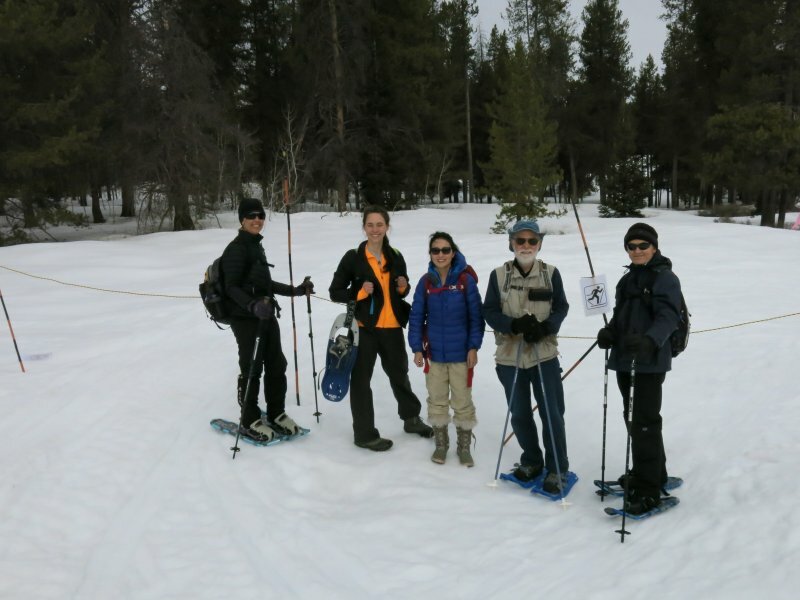 The leader, Dave W. was on cross-country skis, while Jane, Robin, Dave P., Gordon and Alexi had snowshoes. 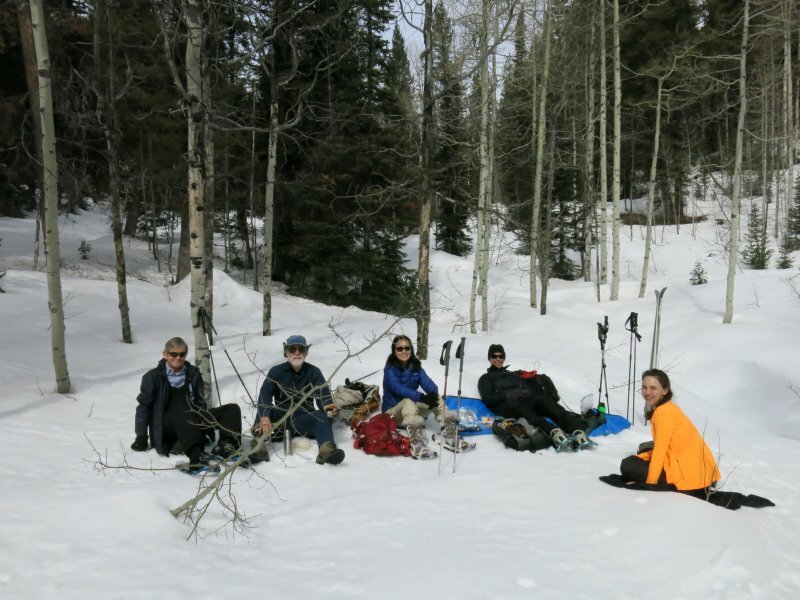 We met at Smith's Marketplace, assembled into carpools and drove up Logan Canyon to the Sink Hollow Winter Trailhead near Beaver Mountain. 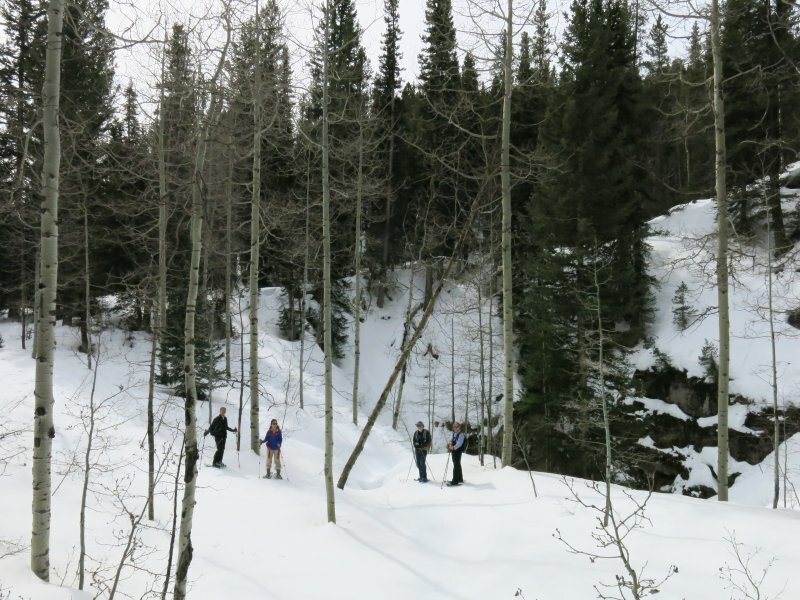 This trip was originally scheduled for Bunchgrass Creek, but we went to Sink Hollow in the hope of finding better snow conditions. The morning snow was icy, firm and packed by snowmobiles, so Alexi decided to forgo using her snowshoes. Her boots only occasionally broke through the crust, but the others were unconvinced as they trudged up the trail with snowshoes and skis. Snowmobiles had driven over the entire route, unlike previous years and in spite of signs designating this as a ski trail. 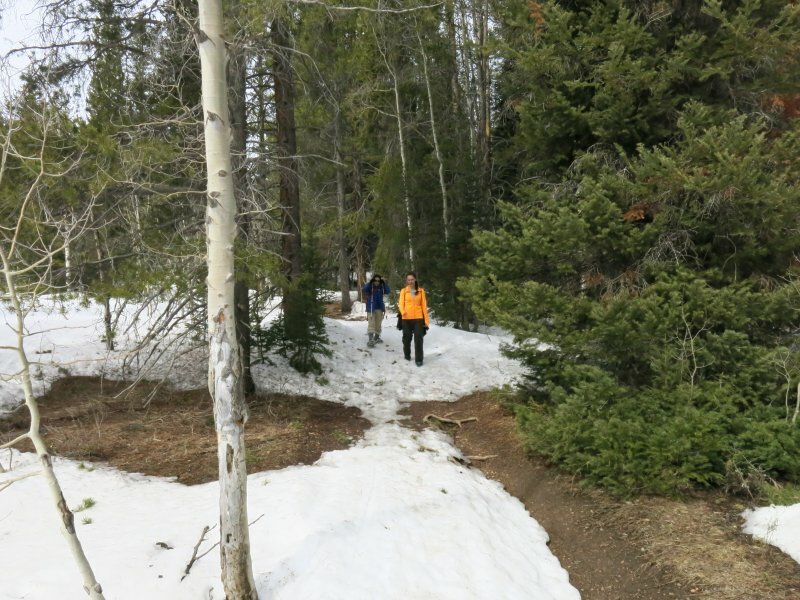 Along the way we came to a spot where the snow surface was littered with lodgepole pine twigs. 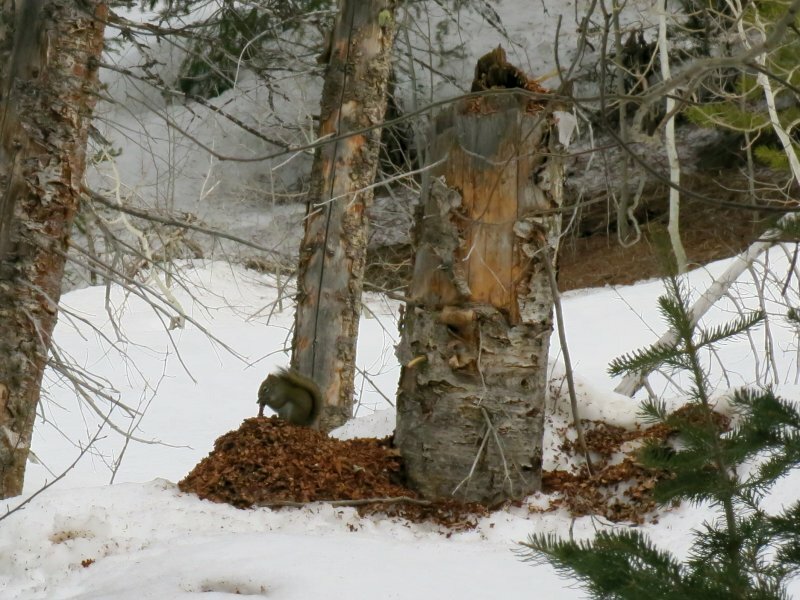 We speculated that the twigs had been cut down by an industrious squirrel in search of pine cones, and sure enough, a short distance up the trail we saw the squirrel feasting on his (her?) bounty. In recent years we usually turned back upon reaching the Idaho border, but today we decided to go another 0.4 miles to the place where, in summer, the trail crosses a creek. There was no water to be seen at this time, however, so we went back to the border for a lunch break. The snow was about 35 inches deep at this location. After enjoying our lunch we headed back down the trail to our cars. 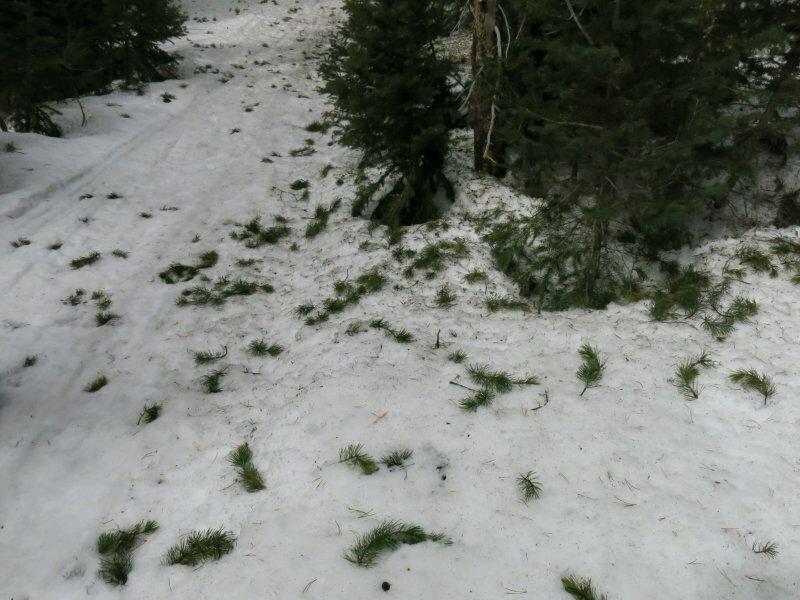 At first, Dave sped down the icy snow on his skis but after about a mile the snow had softened and Dave's progress was slowed a bit. We all got back to the trailhead about 2:30 and Logan about 3:15. This was a good trip! There was adequate snow despite a winter of record-setting warm temperatures. Bright sunlight filtered through the covering of high clouds. There wind was calm and it was quite warm.